Want a 5-Star AC Installation in Fort Myers? 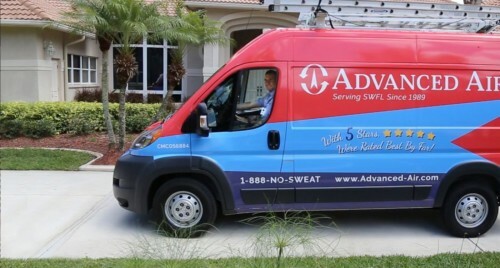 Advanced Air has the most 5-star ratings of any AC installation company in Fort Myers, Florida. For 29 years, it has been our duty to provide the residents in the area with exceptional AC installation and replacement services. Our professional technicians are certified, reliable, and committed to giving you the best experience in town. Contact us for an in-home price estimate - We will come to your home (for free) and diagnose the issue and provide you with pricing options for your Fort Myers home. Contact us online or by phone (888)-853-5143 to schedule a time that works with your busy schedule. Your HVAC Specialist will call you 30 minutes BEFORE arriving. You'll also get an email showing you the name and picture of the tech arriving. Upon arrival, your HVAC Specialist will sit with you and discuss any comfort problems you’ve had and want corrected. We want our customers to be 100% satisfied - which is why we take the time to deeply understand your AC issue. Your HVAC Specialist will then survey your home and calculate what size air conditioner you need. Meaning you'll have an air conditioner that fits your cooling needs like a glove. You'll be presented with "Good", "Better", "Best" air conditioner options and prices for each. We service and install all makes and models of air conditioners- which is why we provide you with numerous options. Need financing? Ask about our financing options, available with approved credit. Want to learn more about air conditioning installation cost factors? Read our blog article, "How Much Does it Cost to Install a Central Air Conditioner in Florida"? We can install that day (if you sign the proposal by 1 PM) or the next day. Don't worry: We'll place drop cloths to protect your home. Also, we'll use a comprehensive checklist to ensure the quality of your AC installation. If you are not 100% satisfied with the air conditioner we installed within the 1st year, we will remove the equipment and refund 100% of your money. Want a smarter air conditioner? Ask about our smart thermostats, which give you precise, energy-saving control over your new AC. Providing AC Installations to Fort Myers, Florida homes and beyond.